House MD Episodes: Season 4 #402 "The Right Stuff"
Fourth Season Episodes :: #402 "The Right Stuff"
House (Hugh Laurie) puts the team member candidates through their paces in the HOUSE episode "The Right Stuff" airing Tuesday, Oct. 2 (9:00-10:00 PM ET/PT) on FOX. Within a few days of the end of the previous episode (he hired people at the end of the previous episode and is now starting to weed them out). Greta, "30 year old", "a captain in the Air Force about to start a new assignment. NASA's astronaut training program" but who had an episode of synasthesia while in an simulator. She wants to make sure there is no record of the diagnosis/treatment. 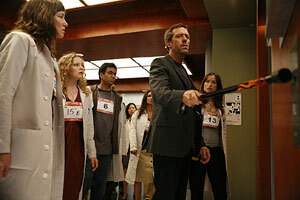 So, House presents it to his candidate, "As far as you're concerned the patient is Osama Bin Laden and everyone not in this room is Delta Force." She gets House's pager number and pays House in cash o find out what is wrong without making a record of it. House writes the patient's address down and gives it to a team of three of the candidates, "Ok here is her address, I want you to break in, find out what she's hiding." Von Hipple-Lindau disease. Chase provides the diagnosis. House (Hugh Laurie) puts the team member candidates (L-R: Heather Fox, Caitlin Dal, Kal Penn, Olivia Wilde) through their paces in the HOUSE episode "The Right Stuff" airing Tuesday, Oct. 2 (9-10 PM ET/PT) on FOX. 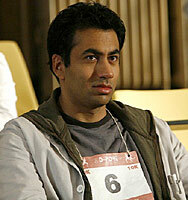 Kal Penn as Dr. Lawrence Kutner in the HOUSE episode "The Right Stuff" airing Tuesday, Oct. 2 (9-10 PM ET/PT) on FOX. Kal Penn as Dr. Lawrence Kutner. The patient explains why she is turning to House, "I did the research, you're the best, you break rules, and you don't care about anyone except yourself." "Well let�s say that's true. You get a new job, the hospital gets a nice wad of cash, what do I get? "I crashed a flight simulator, because I started to hear, with my eyes." 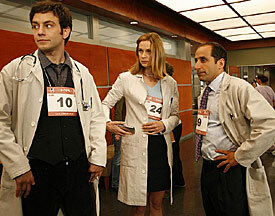 House assigns different candidates to do different things and sends three off to break into the patient's apartment. One of the three asks the others, "Are we sure he wasn't joking? Maybe this is just a test." "Everything's a joke and everything's a test and he wants us to do it.... This is a competition." House thinks he saw Chase in the hallway and he tells that to Wilson, "You saw Chase?" "Last night, outside my office." "It's more curious than actually—"
"Chase took a job at the Mayo Clinic in Arizona. A week ago. Interesting. It wasn't Foreman or Cameron you saw, but Chase, the one you fired." "Not interesting. Someone who looked like someone I used to know walked by my office." "It's always interesting when a repressed guilt starts un-repressing itself." House denies he feels guilty about Chase. L-R: Jonathan Sadowski as Mason, Anne Dudek as Amber & Peter Jacobson as Taub in the episode "The Right Stuff" airing Tuesday, Oct. 2 (9-10 PM ET/PT) on FOX. in the HOUSE episode "The Right Stuff"
airing Tuesday, Oct. 2 (9-10 PM ET/PT) on FOX. Three of the candidates are outside the chapel when House limps up to them, "Paging me during Judge Judy, not the best way to win my affections. "She had another episode of synaesthesia, it set off a psychotic attack and now she ran in there and must've jammed something in the handles." "So you called me, the guy with one good leg and zero leverage." When House turns to walk away, one of them tells him, "We break that door down, security shows up, and her name goes in a file." "Well luckily, violence is not the last resort. Extortion is. So go ahead, extort her." "If you don't open this door, we're going to break it down." "Clever. An appeal to her deep concern for hospital property. Let's see how that works." Cuddy finds out about the patient and asks the assembled candidates, "Who is she?" One of the candidates responded, "...What did House tell you?" "That she is on the run from an international crime syndicate." Another candidate says, "That's what he told us." "House may be your boss, but I'm House's boss. You want to work here, I better be okay with it." Still another candidate says, "Honestly, he didn't tell us anything about who she was, or what she—"
One of them interrupts, "Her name's Greta Cooper. Wants to be an astronaut. Doesn't want NASA to know her brain's getting her ears confused with her eyes. I went through her mail." Cuddy leaves the candidates to find House and tells him, "You're a virus House, now instead of one liability I've got 20." "Apparently only 19. Which number was it?" "From now on everything you do gets charted. With pen, on paper, in a binder that says Princeton Plainsboro Teaching Hospital on the cover.... If you want to run something through the labs, I get a copy. If you do scans, I get a copy. If you think about doing scans, I get a copy." "You know my current thoughts right? I don't have to put those on paper." 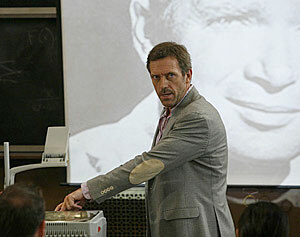 House goes to see Wilson to ask two questions: "How do you scan a liver without scanning a liver? And what's Cameron doing here?" "Interesting. So you're seeing Cameron now?" "No. Not interesting because not seeing. Saw. My patient wont consent to MRI's or ultrasounds, and you've dealt with more liver cancer than anyone else here." "So you want me to share the secret scanning techniques I learned in Nepal? Unfortunately, the monks made me swear a blood oath. Where was she?" "In the lobby. I guess we could palpate the area around the liver." "Which wont work unless the tumour's enormous, which you know, which means your here because these visions are freaking you out. "She had blonde hair, why would I hallucinate that?" "Yes. Yes, why are you merging Cameron and Chase? We should find out before the next time you see her when she'll be black." "Mm-hmm, because, of course it's scientifically impossible for a person to go back and visit somewhere they worked." "No. But since she's not a dead cat, it is scientifically impossible for her to be in two places at once." "Physics joke. Don't hear enough of those." "She just called me from Arizona." Wilson proceeds to dial a number and makes sure House can see what he is dialing. "Notice the area code � 480. They put an offer on a place in Scottsdale. Do you want to talk or should I? I guess we could both talk. Although they're engaged and if you're staying in touch, you might want to buy them—" House hangs up the phone. "Maybe it's not repressed guilt, Maybe it's just panic. Right now you've got enough fellows to build a railroad. But you're going to have to narrow that room full of numbers down to three people." "Any chance you could turn this creative brilliance towards my patient's liver?" "I think you're going to choose people for reasons that have nothing to do with their skills. I think you're going to choose people just because you can't stand them. Because if you like them, well, that's just, stressful." One of the candidates (Number 18) is a Mormon and when House needs someone who doesn't drink, he brings him in and convinces him to take part in a drinking experiment to help diagnose the patient, "I know what I believe. I'm just not quite sure what you believe." "Well LDS doesn't try to dictate every detail of our lives. When a situation isn't clear, we're encouraged to make our own decisions." "But your judgement was to say no. You used my judgement." "You made a good argument." 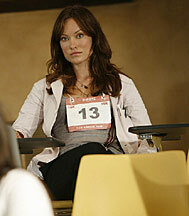 Olivia Wilde, #13, in the HOUSE episode "The Right Stuff" airing Tuesday, Oct. 2 (9-10 PM ET/PT) on FOX. "Only on Christmas and Easter. The rest of the time, it doesn't really matter." "Where's the fun in that? A finite, un-mysterious universe—"
"It's not about fun! It's about the truth." "The truth is, we're having this debate because you want to figure something out about me." At that moment House (who has had four drinks, thinks he sees Foreman. One of the candidates (Number 13) has given out no information about herself, but House has made some assumptions. He asks her, "So how old were you when your brother left home?" "Why do you think that I—"
"Why aren't you answering? Did your mother initiate the divorce?" "We should probably focus on what's wrong with her lungs." Number 13 ignores these questions and focuses on the patient, "She really can't breathe." While doing a diagnostic surgical procedure, House summarizes where they are, "Cysts, synaesthesia, heart attack...."
From the observation deck, they hear a voice saying, "Von Hippel-Lindau syndrome. Raises red blood cell count, causes masses on the organs. One of the masses is a pheochromocytoma. It'd cause neurologic episodes and a heart attack." House recognizes the voice and sees Chase. But he is no longer sure of his own eyes so he asks the candidates with him, "Do you see a blond guy who still has peach fuzz standing up there?" When he gets confirmation, he tells Chase, "This is a closed procedure, gallery's off limits." "Not to the surgical staff. One of the candidates asks House, "You going to hire that guy instead of us." Chase shakes his head at House. "Not a chance. I love you guys. Dig out the cysts, histology to confirm Von Hippel-Lindau"
Later House confronts Wilson, "Calling Arizona, that was a very nice touch." "Not only do I not have residual feelings, I didn't even have primary feelings." "Because you knew it meant—"
"It meant nothing! I saw him because he was there. Did Cameron follow her beshert to the surgery department?" "I think Chase followed her. She's been a senior attending in E.R." the last three weeks. A blonde senior attending, to be accurate." "Foreman. Is he back in neurology?" "He's at New York Mercy, he's been there a month. Did you see Foreman?" House has made a deduction about the candidate whose number is 26, "you never went to medical school? Which is why you let the unlucky number do the Trans echo. At least you're ethically unethical." "Thirty years I worked in the Columbia med school admissions office. Audited all the classes. Most of them more than once. I just never got a diploma." "You had to know I'd find out sooner or later." "I know you break rules. I thought maybe you'd break one for me." "I can't hire you as a doctor. But you can still tell me what you think. You can also fetch me coffee, pick up my dry-cleaning, until I can decide whether or not to keep you." "So I'm playing this whole game to be like— Your secretary?" "Assistant sounds marginally less demeaning." "It's not my dream job." "Actually it is. It's just not your dream title."